Vacation is the best thing about summer, right? In fact some may argue that vacation is the best thing in any given season! But who wants to come home from vacation to find that something had gone wrong in their house? That is why whether you are going out of town for two days or a few weeks, there are things you can do to prepare your house for vacation, to make sure your house is safe during your absence and ready for your smooth return. So prepare a check list, and make sure every point is checked before you leave your house. Here are the top 8 tips to prepare your house for vacation. 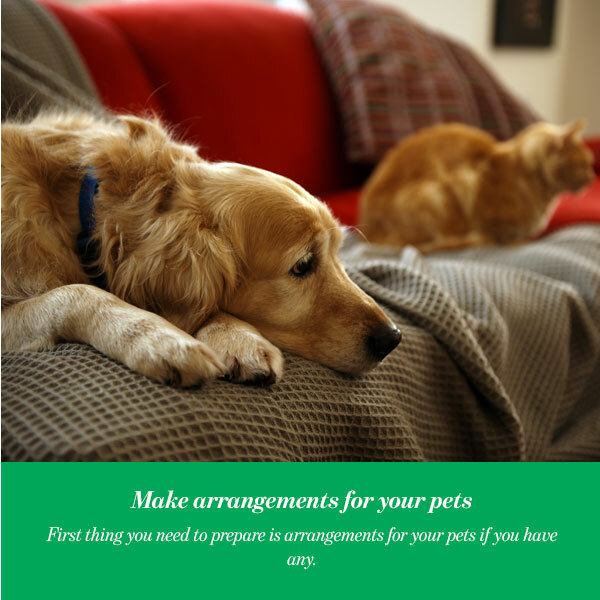 First thing you need to prepare is arrangements for your pets if you have any. Whoever is going to be taking care of your pets needs to get detailed care instructions. Make sure you provide plenty of your pet’s favorite foods, treats, toys, medicines and other supplies on hand. 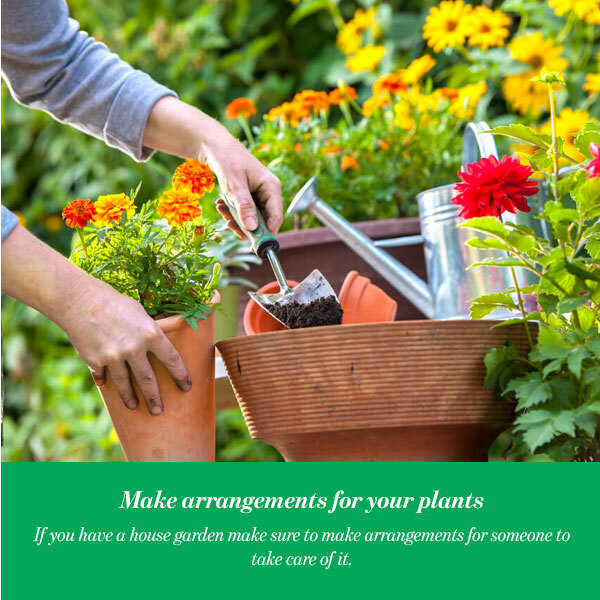 If you have a house garden make sure to make arrangements for someone to take care of it. Houseplants though are a different issue, try to either ask a friend or neighbor to water your plants. Or, you can invest in self-watering plant stakes. Or you can check online and make a DIY one if you are handy. Do not leave any food that will expire while you are gone. It would be a waste to leave it to rot, plus, it might leave a bad smell in your fridge. 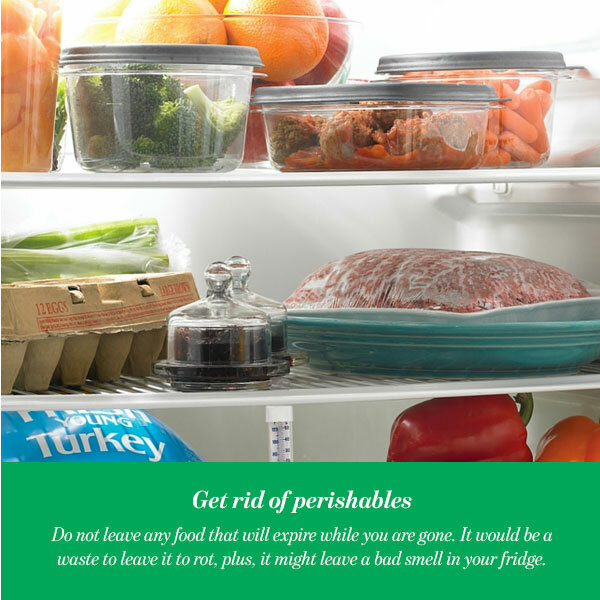 After that you should also wipe your fridge thoroughly, you want to come home to a spotless odorless fridge. But do not leave it completely empty, fill some clean jugs with water and put them in the refrigerator. A refrigerator works better with a cold mass inside to help maintain the temperature. Or, if you are going to be away for a long time you may want to consider unplugging the refrigerator and leaving the door open with some baking soda inside. 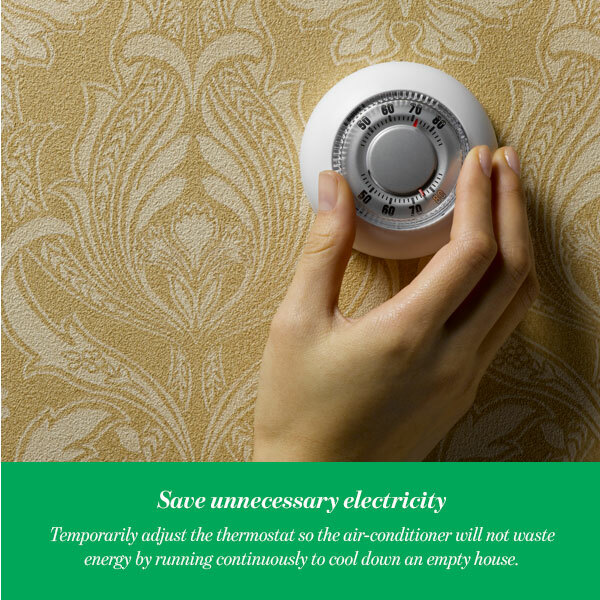 Temporarily adjust the thermostat so the air-conditioner will not waste energy by running continuously to cool down an empty house. A good rule is to keep it a few degrees higher than normal. For example, if you usually keep it at 70, change it to 75. This will also keep enough air circulating in the house to control humidity and mold. And unplug any electric appliances that you do not need like kitchen appliances, televisions and computers rather than just turning them off. Many appliances have an electrical draw when plugged-in, even if they are turned off. 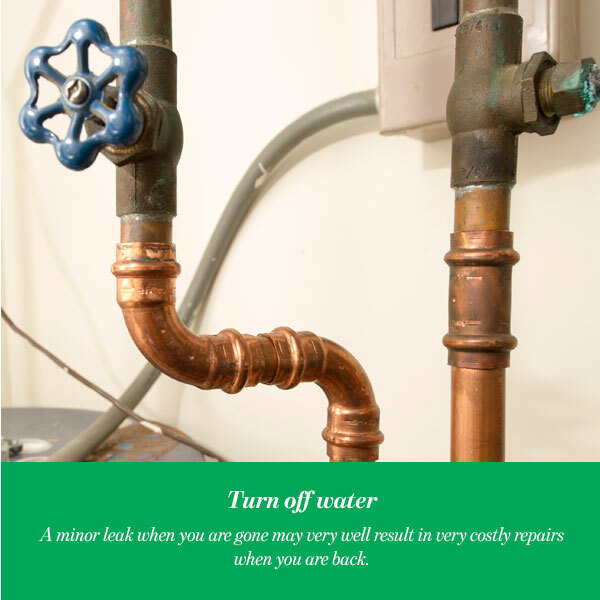 A minor leak when you are gone may very well result in very costly repairs when you are back. That is why it is a very wise idea to turn off water at the main valve. And pour baking soda and vinegar down your drains, this will prevent the water from getting stagnant. 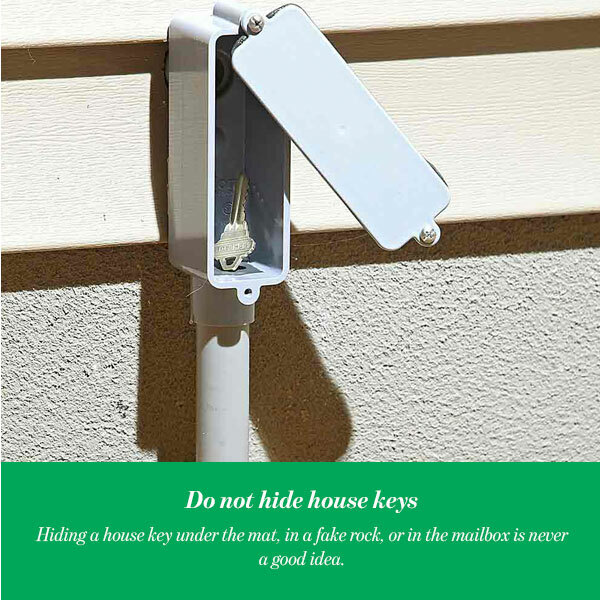 Hiding a house key under the mat, in a fake rock, or in the mailbox is never a good idea. The thieves know about these tricks and look for these easy access vulnerabilities. If you need to leave a set of keys leave them with a trusted friend or neighbor. 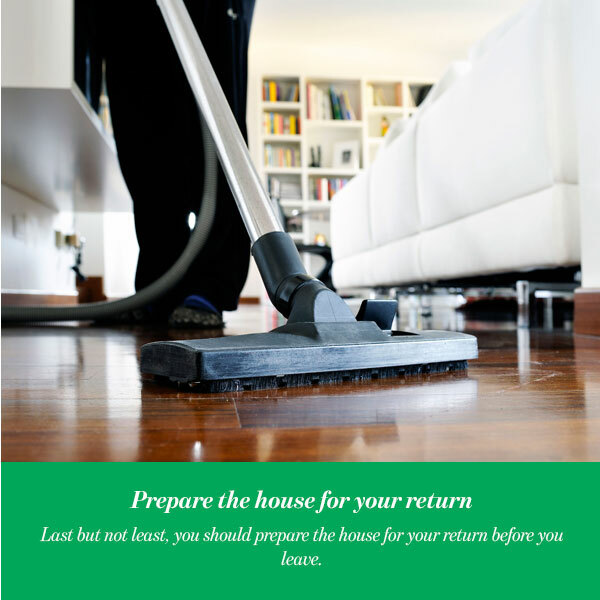 Last but not least, you should prepare the house for your return before you leave. It might not be high on your list when you are trying to pack and leave for vacation, but you will thank yourself when you arrive back to a clean home. Sweep or vacuum floors, do the dishes, wipe down counters in the bathroom and kitchen with an all-purpose cleaner and do the laundry. Do not forget to empty the dryer and the dishwasher. Also change the sheets on all the beds for a nice welcoming first night. 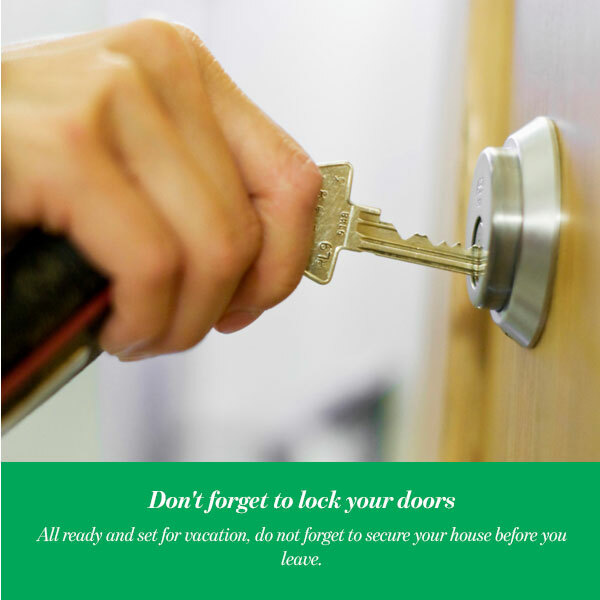 All ready and set for vacation, do not forget to secure your house before you leave. Lock your front door, lock your back door, lock all internal doors and any other external entry ways into your house. Whenever possible, use deadbolt locks. And do not forget to make sure that all of your windows are also locked.